"'My 13-year-old requested this cool and creamy dessert instead of cake for her birthday,' informs Marietta Slater of Augusta, Kansas. 'This easy pie is so popular, it disappears in a hurry.'" Spread 1 cup whipped topping over the bottom of the crust. Drop jelly by tablespoonfuls onto topping; spread carefully. In a bowl, whisk milk and pudding mix until thickened. Add peanut butter; mix well. Fold in the remaining whipped topping. Spread over jelly. Cover and freeze for 4 hours or until firm. Remove from the freezer 10 minutes before serving. Great recipe! Did it as written, other than using french vanilla pudding mix and putting the filling into individual graham cracker crust pie shells. Everyone at the party loved them. Very good recipe. The jelly on the bottom is a great idea. Good either frozen or slightly thawed. FANTASTIC!!! Not overly sweet, super creamy, and great right out of the freezer. My hubby and I just love this, it's definitely a keeper! I think this recipe is wonderful.my children love this recipe. and its fun to make. I add extra whipped cream to this recipe. I used to make this pie often until I lost the recipe. 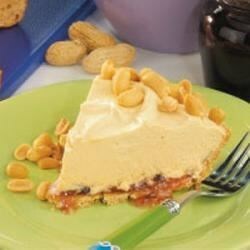 This is the best peanut butter pie, very simple and delicious.